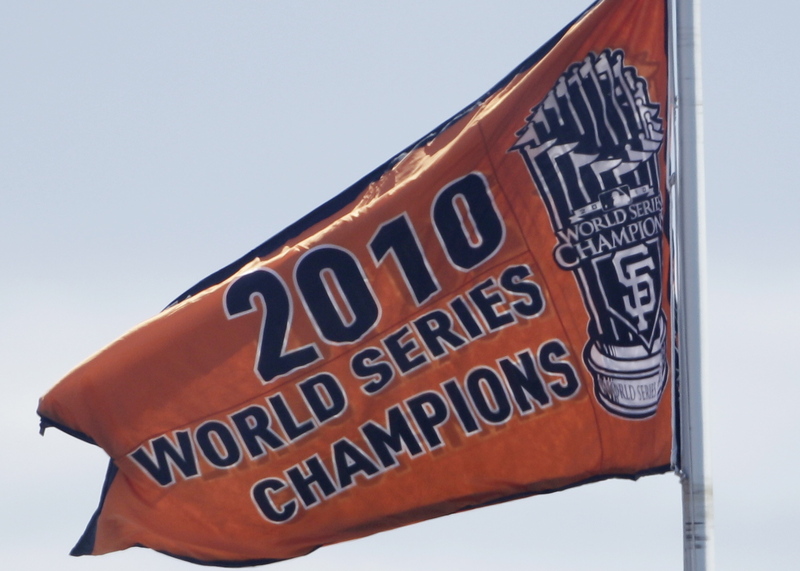 Really, is there any other reason for optimism that you need other than the words: World Series Champion Giants. Reminders of last season’s glory are everywhere: Banners around the stadium, T-shirts worn by fans, commercials on TV. Heck, even when the Giants are in the slump, I often will break out the DVD of last year’s World Series. After last season, diehard Giants fans have to think that anything positive that happens this season is icing on the cake. But there are more tangible reasons — more tangible than good feelings — to be optimistic because of last year’s championship. For one, the excitement created from last year’s title run has carried over to this season. The proof is in the 48 consecutive home sellouts. Having more than 41,000 fans every night cheering you on has to have a positive effect on the Giants. But even more to the point, having more than 41,000 paying customer in the ballpark every night means money is coming into the Giants’ coffers. And that will help the Giants come trade deadline time when non-contending teams are looking to unload salary. The Giants will have the money to pay those players, even with a payroll approaching $120 million. It also doesn’t hurt the Giants’ revenue base to have the team on national TV almost every week, whether it’s on MLB Network, ESPN Sunday’s Night Baseball or Fox’s Game of the Week. And we’ve seen Giants fans coming out of the woodwork on the road, where sometines even road games have home-game feel. That was especially true in the early-season trip to San Diego where Giants fans seemed to outnumber Padres fans. The Giants don’t hit much. But playing in the National League West, they may not have to. The NL West may be the most winnable division in baseball. And even with all of their offensive deficiencies, the Giants are still the team to beat in the NL West. And think about it. The Giants don’t have to contend with the Phillies or Braves. They don’t have to deal with Brewers, Cardinals or Reds. Compared to those teams, the likes of Diamondbacks and the Rockies don’t seem so imposing. That’s because all of the other teams in the NL West also have their deficiencies. The San Diego Padres had a less-than-potent offense last season when they contended for the NL West title. Then they traded away their best offensive weapon — BY FAR. So you knew they weren’t going to be any better offensively. And early in the season, their pitching wasn’t as good as last year. And that’s why they’re eight games under .500, even after winning four in a row. 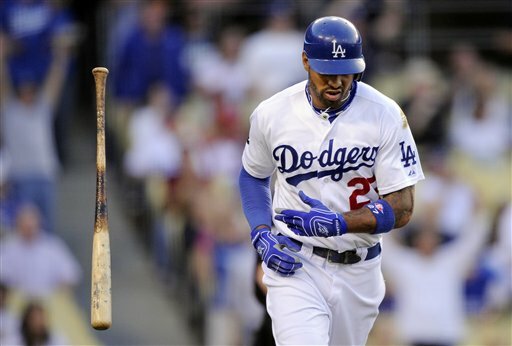 The Dodgers have Matt Kemp, but not a whole lot else on offense. The Dodgers’ lineup has lacked consistency, and so has their rotation. Clayton Kershaw in an all-star, but Chad Billingsley has been hit-and-miss. So has Hiroki Kuroda, and Ted Lilly has not pitched like the Dodgers hoped when they signed him to a contract extension late last season. Then, the back end of their bullpen has spent more time on the DL and on the field. The Arizona Diamondbacks are this year’s San Diego Padres — the surprise team. And like the Padres last year, you have wonder “How long can they keep this up?” Well, last year, the Padres did it with pitching and stayed in it right to the end, aided by some midseason deals to bring in more offense. The Diamondbacks have the offense. Their lineup is loaded with talented, young hitters. But the tendency to strike out — Arizona ranks third in the NL in whiffs — can lead to prolonged slumps. The top of their rotation is very good (Ian Kennedy and Daniel Hudson), but also young. The rest of the rotation is suspect. But the team to really be concerned about is the Rockies. Six games out of first place and one game under .500, Colorado is capable of going on long stretches of success. We’ve seen it before. Carlos Gonzalez and Troy Tulowitzki are just starting to get heated up. And if enough of the supporting players do their part, the Rockies can be dangerous. Although the hitting has struggled, warmer weather and playing in Denver can cure that. The real concern for Colorado is the health of their pitching staff. Jorge De La Rosa is done for the year. Jhoulys Chacin is nursing a sore forearm. Ubaldo Jimenez is trying to find his form from the first half of 2010. The rest of the rotation does not excite. But if things start to click, watch out for the Rox. If you asked someone at the start of the season what the Giants’ strength is, most would say starting pitching. And the starting pitching has been good. The ERA of Giants starters (3.43) is third best in the NL. But starting pitchers are 24-26. So who is it that the Giants are 42-34? The answer is simple: the bullpen. It could be argured that the Giants’ bullpen this year has been the best in baseball. The Giants’ bullpen ERA (2.98) is third best in the majors. The bullpen’s 18-8 record is the best in baseball, by total wins and winning percentage. The Giants’ 25 saves is tied for best in the majors. Their 44 holds is tied for second in the NL. Giants relievers have allowed 25 percent of inherited runners to score, ranking third in the NL. But then you factor in the average leverage index, a stat the measures the amount of pressure a pitcher faces, and you get a greater appreciation of the job the Giants relievers have done. Average pressure is consider 1.000. The Giants’ ALI is an NL-best 1.136. The second-best ALI in the NL is the Cardinals’ 1.090. So no other team has put their relievers in more tighter situations than the Giants, and yet the San Franciscio relievers have responded. And then factor in this. If you consider that the weakest link in the bullpen this season — Dan Runzler — is no longer on the Giants roster, the remaining pitchers in the pen are even more solid. Before being sent down to Fresno, Runzler had a team-high 6.41 ERA (14 ER in 19.2 IP). Remove Runzler’s numbers, and the Giants’ bullpen ERA is 2.65. Heading into the weekend, the Giants find themselves a half-game out of first place despite all of their woes. But the upcoming schedule gives the Giants some room to get things right. With a win this weekend, the Giants will complete a successful interleague homestand. Then it’s one the road for a seven-game road trip to Chicago and Detroit. The Giants play four game against the Cubs, a struggling team that plays as poorly at home as they do on the road. The Cubs entered play 13 games below .500. After a tough 3-game trip against the Tigers, the Giants return home to a stretch in which they play 13 of 17 games at home against the Padres (33-44), Dodgers (34-43), Mets (37-39) and Brewers (42-35). Things get a bit tougher after that, but it’s a favorable schedule that will help the Giants remain in thick of the NL West and wild-card races. I know that a lot of San Francisco Giants fans, also root for the Oakland A’s. Well, MoreSplashHits is not one of them. But we’ll try not be too harsh on A’s fans. It’s bad enough that they play in Oakland, in that ugly stadium. The A’s are one of the few MLB franchises that share their home park with an NFL franchise. After next year, the A’s will be the only one, when the Marlins move into their own park (Note: Toronto shares its home game with a CFL team). Instead, we’ll focus on the misfortune that has fallen on the east side of the bay this season. The A’s and Giants opened the season with teams of similar makeup. Both teams were built on stellar starting pitching, a solid bullpen and an offensively-challenged lineup. And like the Giants, the A’s have suffered some significant injuries this season. But unlike the Giants, the A’s injury problems have attacked their strengths. Three of the five pitchers that the A’s opened the season in their rotation are now on the disabled list: Dallas Braden is done for the season; Brett Anderson is rehabbing his elbow and hopes to return sometime in August; and Brandon McCarthy also is shelved. The A’s also had to suffer through the first two months with their closer Andrew Bailey out injured. All of that led to the A’s being nine games under .500 and in last place in the AL West. It also led to their manager being sacked, and replaced with Bob Melvin. So as bad as things have been going in The City, they’ve been even worse in the East Bay. With all the struggles and all the injuries the Giants have endured, their core strength — pitching — has largely gone unscathed. The only starting pitcher to spend time on the disabled list this season is Barry Zito, and that may have been a blessing in disguise. (Some would argue there’s no disguise at all). Zito was 0-1 with a 6.23 ERA in three starts before suffering a sprained foot and going on the DL. That prompted the Giants to call up Ryan Vogelsong from Triple-A Fresno. 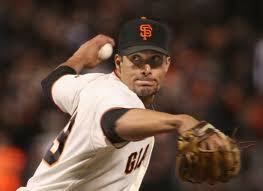 All Vogelsong has done is go 4-1 with a 1.92 ERA in 10 starts for the Giants since Zito went on the shelf. Zito is currently on a rehab stint with Fresno. He’ll make one more start next week in Fresno, then likely will be called off the DL to start one game of a doubleheader on June 28 against the Cubs. After that, no one knows. Zito could pitch in long relief (mostly likely), could pitch as part of a six-man rotation (less unlikely) or could reclaim his rotation spot and send Vogelsong to the pen or Fresno (not likely at all). 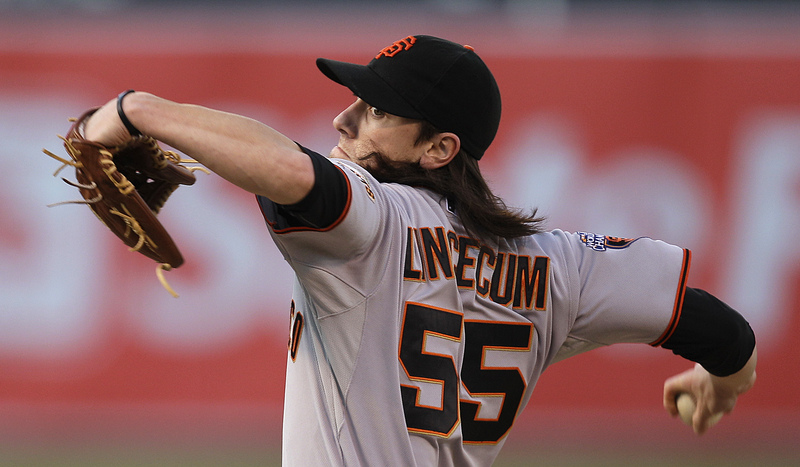 While the Giants sort that out, the starting rotation has been great. The starters’ ERA of 3.31 ranks second in the NL behind the Phillies’ vaunted staff. Still, Giants’ starters have a losing record (22-24) because of a lack of offensive support, an inability to work deep into games (Giants starters rank 8th in the NL in innings pitched) and the Giants’ penchant for winning games late. Still, the Giants have the second best starting ERA in the NL despite Madison Bumgarner’s rough start to the season, Jonathan Sanchez’s control problems and Tim Lincecum’s June swoon. But they’ve stayed healthy, and that’s good news for Giants fans. 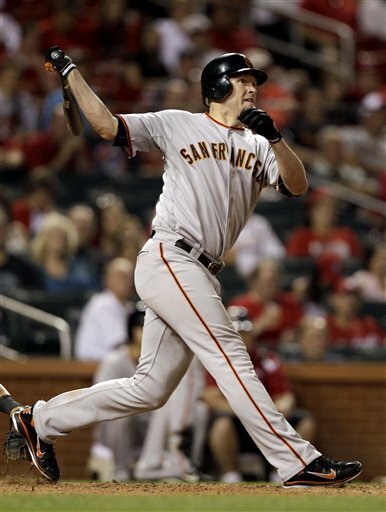 The Giants’ team batting average (.242) ranks 12th in the National League. The teams’ 204 walks ranks 14th in the league. Their slugging percentage (.365) ranks 14th in the NL. Their 241 runs scored ranks 15th. We all knew the Giants were going to be the best-hitting club in the National League. But what we didn’t expect was that their offensive production of 2010 would regress to 2009 levels. Depsite all of these offensive struggles, the Giants have still managed to win games thanks to an outstanding pitching staff. Perhaps Huff needed to change the “we” to “I” as Huff has been the poster boy for the Giants offensive struggles. Yet, Huff is also the poster boy for the Giants’ reason for optimism. Huff’s numbers last year (26 HRs, 86 RBI, .290 avg) were very good, but they were career-year numbers, as some would have you believe. His home run total was the fourth-best of his career. His RBI numbers ranked fifth for his career. His average was his fifth-best for his career. In his career, Huff’s average numbers for a 162-game season were 25 HRs, 91 RBI and .281 avg — pretty much right in line with his numbers from 2010. In short, his 2011 numbers HAVE TO get better. And in recent days, we’ve started to see the tide change for Huff. Huff has hit safely 9 of his last 10 games. After opening the month with .218 average, he’s now hitting .239 — the highest his season average has been since April 18. More importantly, he’s being more patient at the plate, getting ahead of counts and starting to hit to left field. All good signs. And it’s not just Huff. Miguel Tejada is still hitting just .223. But he’s hitting .289 over his last 10 games. Aaron Rowand has seen his opportunities diminish with Nate Schierholtz playing well. Yet Rowand is 7 for 23 (.304) in his last six starts dating back to June 6, mostly against left-handed hitters. And Pat Burrell needs to recapture some of his magic from last year, and not just hit home runs when the Giants are trailing.